I wanted to share this painting I recently did, as I had the forethought to take photos as I went along. This process is definitely a version of the “slow painting” I went over in a blog post earlier this year. Some paintings I hammer out in an hour and a half or two hours. Others take 5,6… 10 hours. I fiddle with them, put them aside, photograph them, assess them, fiddle with them some more, add a wash, etc. With this painting, it was an exploratory process. I could never give a demo with an image like this—when I started, I wasn’t really sure how I was going to paint it. Oh, I have enough experience that I had some vague ideas at the beginning (work light to dark, etc, block in values and hues, etc), but after that… basically you’ve just got to start, and find your way, and keep working until you think you’re done. !! That’s messy, but sometimes it’s the truth. The more complicated the shapes and shifts in value and hue, the more so. Sometimes, you work on it, until you think you’re done, and then you recognize you’ve gone too far. With watercolors, there’s not much going back. There’s nothing to be done but to let that painting be. Either you accept its faults as part of the whole, or you’re deep enough in to an image that you’re prepared to spend another 5+ hours re-building it from scratch in “round 2”. 1) The perspective is skewed in the window panes and the cabinet door. I don’t care much about this sort of stuff normally, but here, the geometry is really very dominant visually. Practically the whole reason I’m painting the image is because of these repeated panes and the dingy empty cabinet. To me, they’ve got to be right or what’s the point in painting them? I need the shapes to be correct so I can tell the story I want, and not have them detract from the experience. 2) The image is, in my opinion, too dark. The contrast is too strong, like a hammer on the head. But the truth is that the exterior here is comparatively a much larger portion of the painting, and much closer to the viewer. After I finished, I recognized I wanted more “push and pull” between the interior and exterior. I needed more compelling details. 4) The image is just a little too static with just the panes and the cabinet. I felt that I wanted a third location to draw the eye and circulate you around. I had additional source photos, and used them to nudge things around. I don’t have a photo of my sketch, but with all the above thoughts in mind, I brought together different source photos and began to build my image. As you’ll see, none of them are good photos. I’m not copying the photo, that’s for sure. I paint partly from the photos, salvaging and cobbling details together as I need them. I paint partly by feel, and discover things as I go along. I paint partly from memory, from a sense of smell and emotion and tactile input, and just trust that I’m listening and being true to what feels right. Here, I brought the exterior view in from a different photo that had shifted ever so slightly to the left. It’s just off-screen in the other photo. and the cabinet shelves came from another. I added in the other box on a shelf to activate the area visually and hold the eye a bit more. Sometimes, you can’t do big global washes. The edges and white areas are too distinct, the hues too different, and the values too similar. You have to approach things differently and paint each area individually. Each windowpane is a small painting. The cabinet is a painting. The wall is a painting. The old dog door, etc. It’s slow and more painstaking, but if you want control over your shapes and hues and values, it’s the only way I know. Here you can see me beginning to layer in darker shapes- the darker trees in the background go in, the shadows under the leaves that have a crisp edge, the shadow on the little exterior wall to the left. The exact same process was used earlier for the dog door, the brown mat outside the windows, the odds-and-ends and darker shelves in the cabinet, etc. These shapes are blocked in now partly because they’re a darker value than the areas around them, but even more so because I want the edges to help separate things. As I put in washes later, the edges will soften some, but the shape of things will remain. Here you can see the shadow on the door, where I have a hard edge on one side and a soft edge on the other. The surface of the paper has to be dry to get that crisp edge. The dark warm interior of the cabinet, the dark cool wall around the cabinet, and the area under the window are all glazed too. Note the large (though not very dark) cast shadow out in the garden. Here you can see two things I’m focusing on. The first is that I’m beginning to work on the window trim, creating my shadows. But also, I begin here to drop in big, semi-global washes to darken whole areas. All the prep work earlier, cutting edges and dropping in localized, shape-specific darks, begins to pay off. I can make a big wash over the whole area for the cabinet and everything in it, and I retain my individuated shapes, and yet everything is bonded together and softened by the wash. Same goes for the doggy-door area, where I’ve dropped a global wash in, with a darker, graduated area under the window sill. This helps that area feel recessed, as if there’s a very soft cast shadow within the cavity. My desire to paint this has a lot to do with paying tribute to this space. So all the scruffy little bits mattered to me. The left over duct tape on the window to seal a crack, the scruffy patch on the wall, the window putty to seal the panes, the cobwebs, the dusty grime on the windows, the little specks and nails and scratches. This is a meticulous part, but done with love and precision. I darken things up too, here and there- the wood around the dog door, the trim around the panes, etc. I got to this point after a long day of painting, about 7 or so hours straight. Got a kink in my neck. Took some Ibuprofen, etc. I thought I was done. I even framed it up to share for Thanksgiving, but…. Framing and photographing things is very instructive. They often help you see things objectively, like someone else painted it, instead of how you dream it looks. Photos often change things too- push contrasts and shift hues, etc. Sometimes, I like the photo better, and understand how I should change a painting. Sometimes, I can tell the painting is done instead, and I have to correct the photo to match it. So I framed this up and shared it. But once I got home, I thought “What is this painting about? Where do I want your eyes to go?” The light was a little too flat, the contrast too muted. Where was the drama? The reflected light that seems to have no source (bouncing off the hidden side of the open cabinet door) was compelling to me. Some of it, honestly, happened by accident, but some of it was on purpose. I recognized the preserved highlights, and decided to push the effect. I wanted to pull you in to the edge of the panes, where that warm raw lumber is, and the light arrives from both inside and out. This is not really how it is in any of the photos, but I could see now, towards the end, the story I wanted to tell. 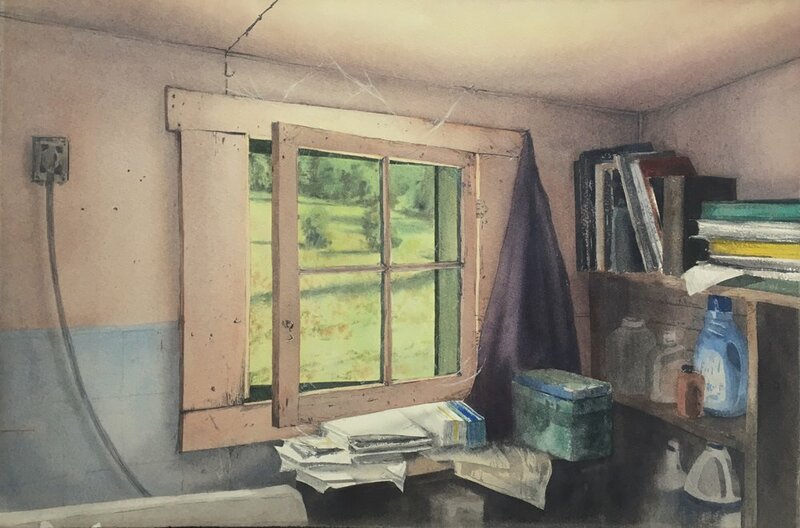 I pushed the transition in value on the right side of the window pane, lightening and lifting up top, while darkening the values in the bottom right corner. I gently darkened various things once more- the edge of the window sill, the area by the dog door, the cabinet interior, and the bottom right corner of the room. I also darkened the far left side of the painting- the window sill and the panes- to push your eye in towards the gentle glow. And then I was done. Sometimes, these things are a meandering affair and you end up at the finish line unexpectedly.